Blythe loves her job and doesn't need personal relationships, especially of the "love life" variety. Steeling herself from a recent heartbreak, Blythe focuses on furthering her successful career, but when her father needs surgery, Blythe returns home to help with the family auto shop. There, she comes face-to-face with the dreams of her past. Werner rode his trail bike at a good clip in the crisp December air. In many ways, the trail was similar to the railroad tracks he’d hiked as a kid. The difference was a much less treacherous rock covered grade. He slowed as the rhythmic sway of a jogging woman’s ponytail mesmerized him. Something about her tugged at his heart. Just as the woman ahead ran out of sight, he neared the spot where he’d first met Blythe Travis. The field remained an open pasture gone to natural prairie. Surprisingly, green grass peeked through the dormancy of December. He geared down and rolled to a stop, his mind going back in time. For a short while as a kid, his folks had rented a farmstead beyond the copse of trees in the distance. He’d ventured across the field to walk the railroad tracks only to find a girl with hair blacker than ebony watching him approach. Blythe. He now balanced, one foot on the ground, and imagined her waiting for him on those long-ago, lazy summer afternoons. They’d shared many adventures and even followed the creek to a beaver dam one day. Agreeing to savor that memory, they never returned to seek out the beavers. Soon, they’d meet again. Where was she now, wasting time during a layover in a busy airport? The trail snaked ahead, where he’d heard a train whistle blow near Edgewood long ago, but they’d never seen a train during their excursions. Like many tracks across the country, the rails were long gone and repurposed as an exercise trail. He stared off into the distance as though he had the ability to make Blythe appear. His heart quickened at the prospect of seeing her all grown up. His mouth went dry. Blythe’s beauty often stole his breath as a kid. Her parents said she used this path whenever she came home to visit as an adult. What was she like now? He’d seen pictures. Though her job took her to exotic places across the globe, her skin glowed like porcelain in the photos displayed. Had she ever thought of him? He was eager. Would she remember him? Her flight was due in past midnight. Surely, her parents had told her that he was the temporary mechanic. A rustle in the bush ten feet ahead pulled him from his thoughts. A flash of red, a rustle of brown and orange. A pair of cardinals swooped in. The female flitted to the naked branches of a honeysuckle bush and the male dropped to the ground next to something that glinted in the early morning sun. He’d heard a few male cardinals sing since he’d returned to Nebraska, and he’d caught the familiar crimson streak on occasion. But these birds were the first pair he’d seen since his grandfather’s graveside service in Illinois when Werner had been a teen. 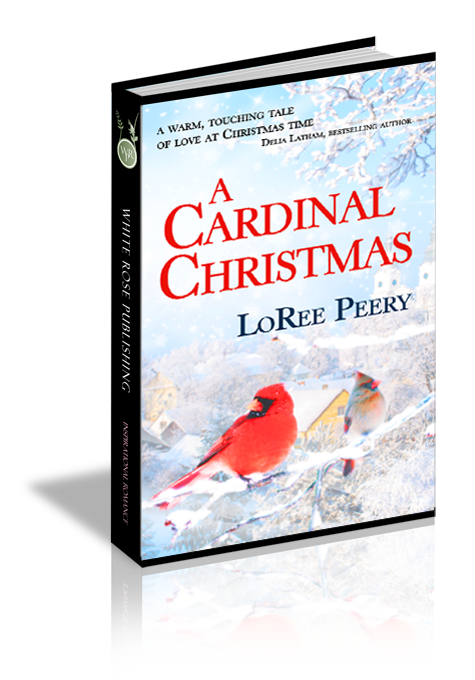 At that time, a pair of northern cardinals had settled in a nearby juniper bush. The sight of the birds distracted him and occupied his mind, freed him from giving in to tears while the pastor droned on. He sucked in a breath to handle the hurt. The thought of funerals stabbed him anew. No cardinals or any other creature showed up in Seattle on that most recent day. The loss of his parents remained fresh. The sun sparked on whatever lay amidst the crushed rock on top of the graded bank. Werner swung his foot to engage the kickstand. The cardinal pair flew off. Crossing to the larger rocks along the path to where the male cardinal had been, he spied a necklace. The ring on the clasp was open where the silver chain had parted, but the pendant remained intact. Pretty. He swiped off his glove with his teeth and reached for his phone. He snapped a picture, lifted the necklace, and let the chain dangle as he studied two large seed pearls set in fancy swirls. Mounted inside a heart, the jewelry no doubt meant something special to the owner. The necklace was a nice piece of jewelry. Whoever it belonged to would surely miss it. He slipped the necklace into his jacket pocket and zipped it in tight. Maybe he could catch the raven-haired jogger to see if she’d lost it. Blythe’s feet pounded the well-worn trail. She hadn’t run off as much negativity as she needed to this morning. Despite her early morning arrival in Edgewood, she’d hurried out of the house as her mother headed to the hospital to be with her father. Sprinting, then jogging, hadn’t helped her mind calm. It seemed odd to run so close to Christmas with green grass on either side of the graded path rather than the landscape covered in snow. This time of year, she was rarely in the States. She usually ran barefoot on white sandy beaches, welcoming sunrise at an exotic resort. Not this year. Home for the holidays due to her father’s knee replacement. Even before that surgery was scheduled, Blythe had not received an assignment to oversee the management of any Eiseley International resort. Last year at this time, she was all aglow over her recent engagement. While at home then, she’d turned ecstatic watching her best friend Hayley fall in love with the preacher’s house sitter. One thing that never changed in life, change was a sure thing.